El Salvador -- a small, densely populated country of six-million people -- is one of the most water-stressed countries in the world. The country's battle against mining is directly linked to initiatives taken within the past decade to develop long-term strategies to address its urgent water crisis. A 2010 study by El Salvador's Ministry of National Resource and the Environment found 98 per cent of water sources were deemed to be contaminated and unfit for drinking. Consequently, successive Salvadoran governments have placed a moratorium on mining, leading Canadian Australian mining firm OceanaGold to sue the Salvadoran state for loss of potential income, even though the company was never granted a license to operate. In anticipation of an imminent ruling from a little known investor-state arbitration tribunal at the World Bank that could force El Salvador to pay Canadian-Australian mining firm OceanaGold US$301 million, a Salvadoran delegation visited Canada to discuss how investor-state arbitration threatens democratic decision-making, public health and the environment here and beyond our borders. The SJF was one of the key sponsors of this tour. From May 11 to 15, Yanira Cortez, Deputy Attorney for the Environment for El Salvador’s Human Rights Prosecutor’s Office and Marcos Gálvez, President of the Association for the Development of El Salvador (CRIPDES, a founding member of the National Roundtable against Metal Mining) traveled from Montreal to Ottawa-Gatineau and Toronto. 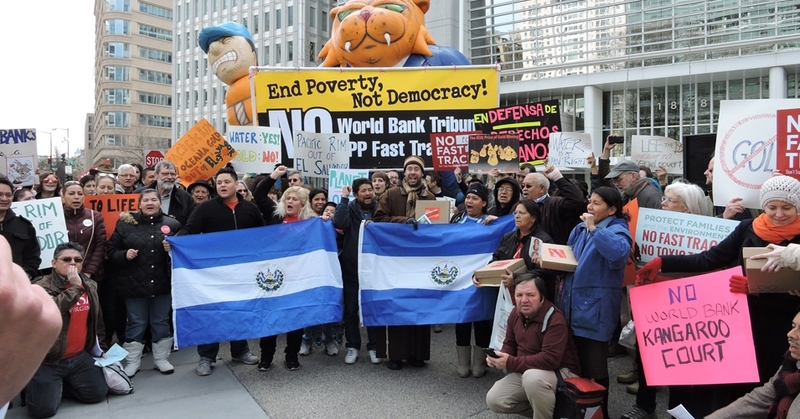 They met with the public and with Members of Parliament to request support for the Salvadoran people’s struggle and warned of dangers that Canadians face through investor provisions in existing and proposed free trade agreements. The visit reiterated criticism made by the International Trade Union Confederation on arbitration procedures known as Investor to State Dispute Settlement (ISDS) that allow corporations to sue governments whenever elected representatives put human rights and the public interest ahead of private investments.